The first African–American woman to represent North Carolina in Congress, Eva Clayton became the state’s first black Representative since 1901. From her post on the House Agriculture Committee, Clayton advanced the interests of her rural district in the northeastern part of her state and called attention to the economic inequalities that affected African Americans nationally. Eva McPherson was born in Savannah, Georgia, on September 16, 1934. She grew up in North Carolina and received a bachelor of science degree in biology from Johnson C. Smith University in Charlotte, North Carolina, in 1955. In 1962, she earned an M.S. in biology and general science from North Carolina Central University in Durham. She originally planned to become a doctor and travel to Africa to do missionary work. Shortly after receiving her undergraduate degree, Eva McPherson married Theaoseus Clayton, who became a prominent lawyer. They raised four children: Theaoseus Jr., Martin, Reuben, and Joanne. The civil rights movement mobilized Eva Clayton to become active in civic and political affairs. At one point, she even picketed her husband’s law office to protest Theaoseus’s and his white law partner’s ownership of a building that contained a segregated restaurant.1 As early as 1968, Eva Clayton was recruited by civil rights activist Vernon Jordan to seek election to Congress in a north–central North Carolina district. Though Clayton won 31 percent of the vote in the Democratic primary, incumbent Lawrence Fountain prevailed. However, Clayton’s campaign had the intended effect of spiking black voter registration.2 “In 1968, the timing wasn’t there,” she later admitted.3 After the birth of her fourth child, Clayton reluctantly withdrew from law school. “I wasn’t super enough to be a supermom,” Clayton recalled years later. “I left to be a mom. My husband was supportive, but I felt enormously guilty. I think I would do it differently now. I think I would know how to demand more of my husband.”4 In the early 1970s, she worked for several public/private ventures, including the North Carolina Health Manpower Development Program at the University of North Carolina. In 1974 she cofounded and served as the executive director of Soul City Foundation, a housing organization that renovated dilapidated buildings for use as homeless shelters and daycare centers. Two years later, she worked on the successful gubernatorial campaign of Jim Hunt, who later appointed Clayton the assistant secretary of the North Carolina department of natural resources and community development. Clayton served in that capacity from 1977 until 1981. After leaving state government, she founded an economic development consulting firm. In 1982 she won election to the Warren County Board of Commissioners, which she chaired until 1990. Over the next decade, Clayton helped steer more than $550 million in investments into the county and also successfully passed a bond issue for the construction of new schools. When Representative Walter Jones, Sr., announced his retirement in 1992, Clayton entered the Democratic primary to fill his seat. Recently reapportioned by the state legislature, the congressional district was one of two in North Carolina that had a black majority. Jones died in September 1992, and his son Walter, Jr., who was considered the favorite in the primary, captured 38 percent to Clayton’s 31 but fell two points shy of winning the nomination outright. In the runoff, Clayton secured the support of her other primary opponents and won 55 percent to Jones’s 45 percent. In the general election, Clayton ran on a platform of increased public investment and job training for rural areas in the district, which encompassed a large swath of eastern North Carolina including the towns of Goldsboro, Rocky Mount, and Greenville. She advocated slashing the defense budget to lower the federal deficit. “We went into the projects and knocked on doors and got people out” to vote, Clayton recalled.5 On November 3, 1992, she won the special election to fill the last two months of Walter Jones, Sr.’s unexpired term in the 102nd Congress (1991–1993) and defeated Republican Ted Tyler for a full term in the 103rd Congress (1993–1995). Mel Watt, an African American, also won election from a North Carolina district to the House on November 3, but because Clayton was elected to the 102nd Congress, she became the first African–American Representative from North Carolina since George White, who left Congress in 1901. In her subsequent four bids for re–election, she won comfortably, with 60 percent or more of the vote. She defeated Tyler three times, even in 1998, after court rulings reshaped the district once again by adding 165,000 new constituents and shrinking the African–American majority by 7 percent, effectively dividing the district between black and white constituents. In 2000, the GOP ran Duane E. Kratzer, Jr., who managed just 33 percent of the vote to Clayton’s 66 percent. Clayton claimed her seat in the 102nd Congress on November 5, 1992, but did not receive committee assignments until the 103rd Congress convened in January 1993. She won spots on the Agriculture and Small Business committees. Clayton eventually became the Ranking Democratic Member on the Agriculture Committee’s Operations, Oversight, Nutrition, and Forestry Subcommittee. Her Democratic colleagues also elected her the first woman president of the freshman class. In 1995, she was appointed to the Democratic Advisory Committee to formulate party strategy. In the 105th Congress (1997–1999) she dropped her Small Business assignment for a seat on the prestigious Budget Committee. Clayton was also assigned to the Social Security Task Force. Clayton’s district suffered a major natural disaster in 1999 when Hurricane Floyd dumped rains on the state, submerging parts of eastern North Carolina under 14 feet of water from swollen rivers. Clayton and other Members of the state delegation secured billions in relief aid. Clayton also obtained $1.5 million in federal money to reconstruct a dike along the Tar River in Princeville, one of the nation’s first towns chartered by African Americans. She also assembled a volunteer force of more than 500 people, to help flood victims throughout eastern North Carolina. In November 2001, Clayton declined to seek renomination to a sixth term in the House. She had been involved in intense bargaining with state legislators to ensure that her predominantly African–American district was “protected” during reapportionment after the 2000 Census. “My heart is leading me somewhere else,” Clayton said. “I don’t know exactly where that is, but I do want to have another opportunity for public service before I really hang it up.”11 Clayton was succeeded by an African–American, Frank Ballance, Jr., in the fall 2002 elections. After retiring in January 2003, Clayton returned to her home in Littleton, North Carolina. 1Rob Christensen, “Clayton to Retire in 2002,” 21 November 2001, Charlotte News and Observer: A1. 3Scott Mooneyham, “Clayton Announces She Will Retire From Congress,” 20 November 2001, Associated Press. 4Marian Burros, “Rep. Mom: Even in Washington’s Watershed Year, Laundry Still Needs Doing,” 20 June 1993, Chicago Tribune: woman news section, 12. 5“Eva M. Clayton,” Associated Press Candidate Biographies, 1998. 6Almanac of American Politics, 2002 (Washington, DC: National Journal Inc., 2001): 1139–1140. 7Politics in America, 2002 (Washington, DC: Congressional Quarterly Inc., 2001): 738–739. 8Current Biography, 2000 (New York: H. W. Wilson and Company, 2000): 121–124. 9“Eva M. Clayton,” Contemporary Black Biography, 1998, Volume 20 (Detroit, MI: Gale Research Inc., 1998). 10“Congresswomen Lead Campaign for Summer Jobs for Black Youth,” 15 April 1996, Jet: 39. 11John Mercurio, “Going Home: Clayton Will Retire; But North Carolina Map Expected to Alter 1st District Only Slightly,” 26 November 2001, Roll Call. Papers: ca. 1992-2002, 359 archival boxes. The papers of Eva Clayton contain floor statements, committee reports, speeches, correspondence, records of donations and events, and other materials that chronicle Rep. Clayton’s time in the United States Congress. Also included is information on personal projects that Rep. Clayton was particularly passionate about, including the U.S. Department of Agriculture and their treatment of black farmers, Hurricane Floyd’s impact on North Carolina’s agricultural community, the Congressional Black Caucus, and the Rural Caucus of North Carolina. Researchers need to contact the library regarding access to the collection. Oral History: ca. 1994-1996, amount unknown. The interview with Rep. Eva Clayton is part of the Voting Rights Act Oral History Project. Topics discussed include her election to Congress, committee service, work as a member of the Warren County Board of Commissioners, and her involvement in redistricitng. Oral History: ca. 1989-2000, amount unknown. 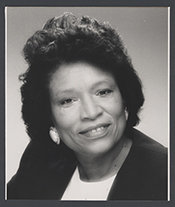 Interviews with former Congresswoman Eva Clayton are in the Southern Oral History Program Collection. Papers: In the John W. Hatch Papers, 1967-1995, 23.5 linear feet. Persons represented include Eva Clayton. Papers: In the Records of the Washington Office on Africa, ca. 1970-1996, 35 linear feet. Persons represented include Rep. Eva Clayton. Clayton, Dewey Monroe. "The Politics of Congressional Redistricting: A North Carolina Case Study." Ph.D. diss., University of Missouri - Columbia, 1995. "Eva M. Clayton" in Black Americans in Congress, 1870-2007. Prepared under the direction of the Committee on House Administration by the Office of History & Preservation, U. S. House of Representatives. Washington: Government Printing Office, 2008. "Eva M. Clayton" in Women in Congress, 1917-2006. Prepared under the direction of the Committee on House Administration by the Office of History & Preservation, U. S. House of Representatives. Washington: Government Printing Office, 2006.